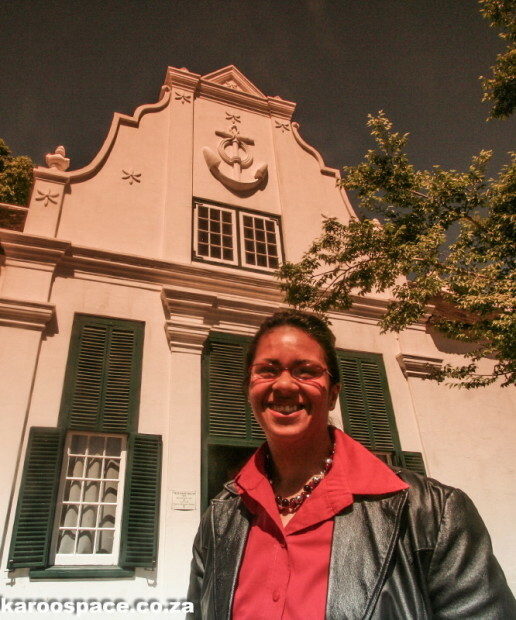 Anziske Kayster, author of this article, is head of Graaff-Reinet Museums and a keen social observer. 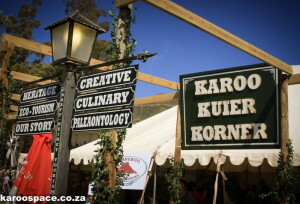 At the Karoo-lus Festival in Graaff-Reinet, a typical sign. “If you don’t speak Graaffrikaans then, foeitog, you don’t know South African English. Here, in our platteland dorp, we’ve got to hou kop when an uitlander comes to kuier or he’ll get half deurmekaar with our skeef English. And don’t los out the Rooineks who went to Bishops and St. Andrews, hey! They are eintlik worse than the ous from Volkskool who try to talk ordentlike English. “Toemaar, we’re a helpmekaar klomp on the whole, even those who spog at the Stockfair with their spekvet hamels that were reared on the vleis to get them slagbaar in the droogte. 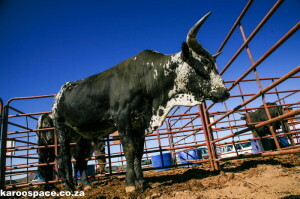 You won’t verneuk the auctioneer with your vrekmaer stock that you ja’d out the mountain after the first little vlagie, to spare the vlakteveld. You maar groet everyone on Stockfair days. “Nee wat, if you really want to hear ware South African, you should come and hear how we talk, because it’s mos verspot to expect me to say ‘family-fond’ like Jane Austen in Bath when I erfed the word ‘familievas’ from my ouma on Klipfontein. Platweg we may be, but dom we are not. 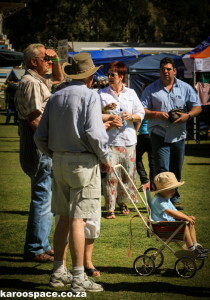 Graaff-Reinet’s English- and Afrikaans-speaking communities happily chat in Graaffrikaans. “It was really hot that day when I attended the begrafnis of old Swanepoel. The Swanepoels were bywoners on our farm for many years so I felt it was my plig to represent the family. The kis was put in the shade of the pruimboom, which apart from the odd karoobossie and the people attending the begrafnis, was the only other thing that represented life on the werf. This article was first published in a Graaff-Reinet Museum newsletter, 2012. 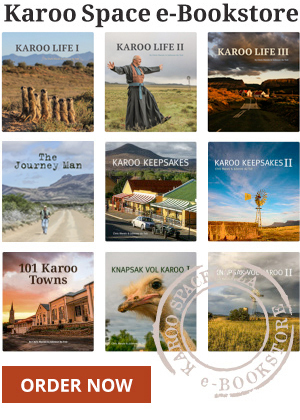 My love of the Karoo was born in my childhood. I was an only child living in Johannesburg with boring parents (in my view). The highlight of my year was a trip by train, together with an elderly aunt, to Graaff Reinet where we were picked up and taken to my uncle’s farm Wheatlands, south of the dorp on the way to Jansenville. Not only was I part of a family of five kids, but I could pretend to be the sixth. The wide open spaces were there for our enjoyment. We rode horses, rode on the back of bakkies, climbed Compassberg. Today I can really appreciate Graaffrikaans because I live in the Swartland where we also speak a strange language. When I go back to Johannesburg I have to remember to speak ‘ordentlike’ English. in our everyday lives we speak a language that we all understand and is very expressive in its context. What shall we call it – Swartlandikaans? Maybe your readers have some suggestions.